Glorious Easter morning sunrise in San Diego California with a Cross silhouette on top of a hill and dramatic clouds off in the distance. Easter morning is still a very special morning for me and so I woke up early this Easter morning in search of a Glorious Easter image and remembered this cross. Funny story behind this shot though, I was pulled over on the freeway and so focused on taking this shot that I hadn't noticed a police officer had pulled up behind me to come and check on me. He was already standing in at my window before I even noticed he was there. Scared me to death needless to say... He wanted to know, "are you okay, what are you doing?" I told him I was taking a picture of the cross on the hill behind him. He turned around and noticed it and then told me to hurry up and get going. Yes sir, and I headed off down the highway. This was the shot I had invisioned for my Easter Sunrise image, but since there were no clouds that morning I added my own. Hope you don't mind. 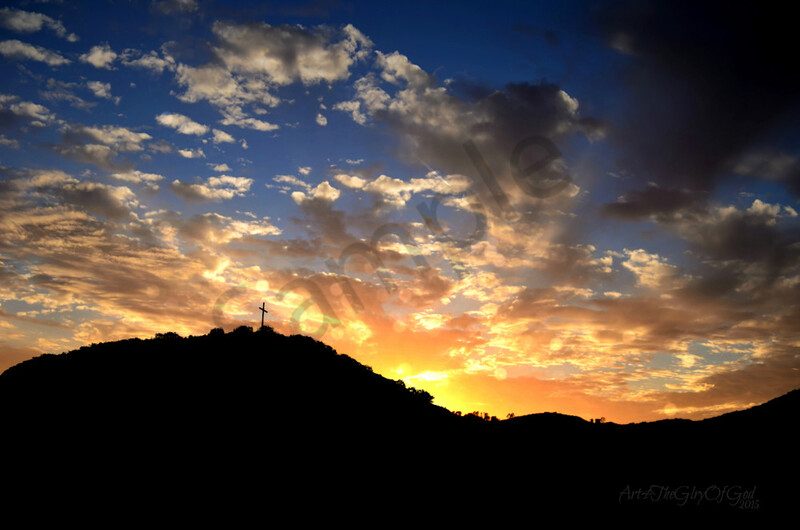 Easter morning sunrise with cross silhouette on top of a hill in San Diego California.